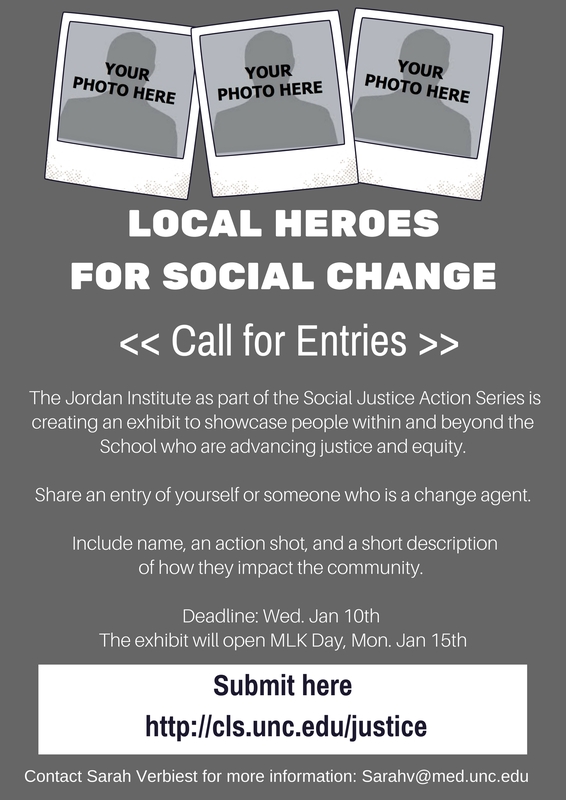 Share a photo and short description about yourself or someone else from the community to be spotlighted as a Local Hero for Social Change–modeled after an exhibit in The Center for Civil and Human Rights in Atlanta. The Jordan Institute will be showcasing all heroes. 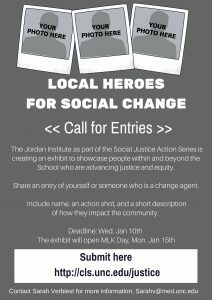 We’ll begin taking submissions for the exhibition on January 15 (Martin Luther King Jr. Day), and continue through February. We’ll reach out to all local heroes before we feature them on our wall. Thank you! 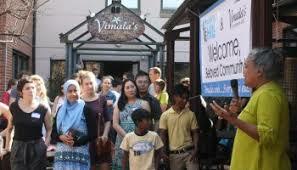 Description: Vimala has been a longtime activist for progressive causes including grassroots media, international peace, and stopping domestic violence. Through it all, she has fed the movement. Her food has shown up everywhere, from protests across the region to fundraising for individual and community causes. She lives by her motto: “Vimala cooks, everybody eats.” She started with home-based community dinners, and now at her restaurant, CurryBlossom Cafe, she continues a policy of not turning away anyone for lack of funds. She regularly hosts communal meals to nourish and share resources with community members, including monthly dinners for refugee families.